2 1700hp (1268 kW) Wright R-2600-13 Double Cyclone 14-cylinder two-row radial engines driving three bladed propellers. Later production models (B-25C-1) had wing racks for 6 to 8 325 lb (147kg) bombs and could be fitted with a torpedo rack in place of the usual internal bomb load. The B-25 lacked armor and self-sealing tanks. 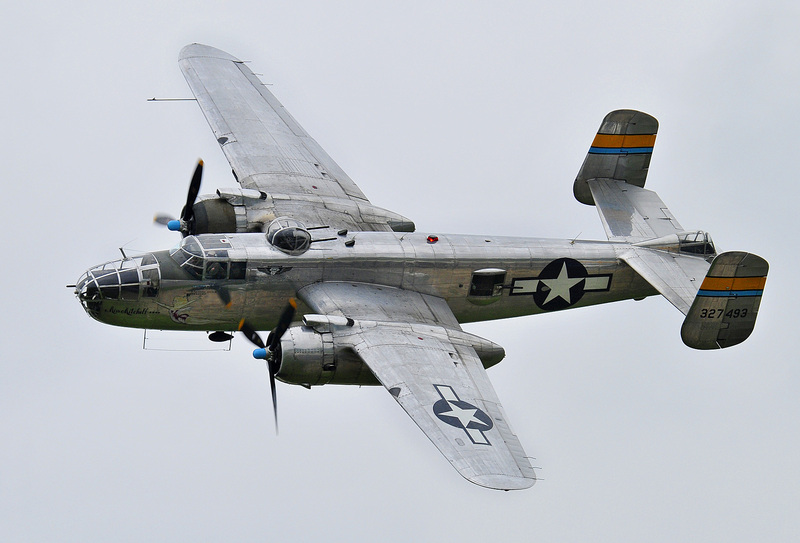 The B-25 and the B-25A were armed only with single 0.30 machine guns in the waist windows, tail, and nose. The B-25B and earlier models were equipped with 1350 hp (1007 kW) R-2600-9 engines and lacked exhaust flame dampeners, making them unsuitable for night combat. 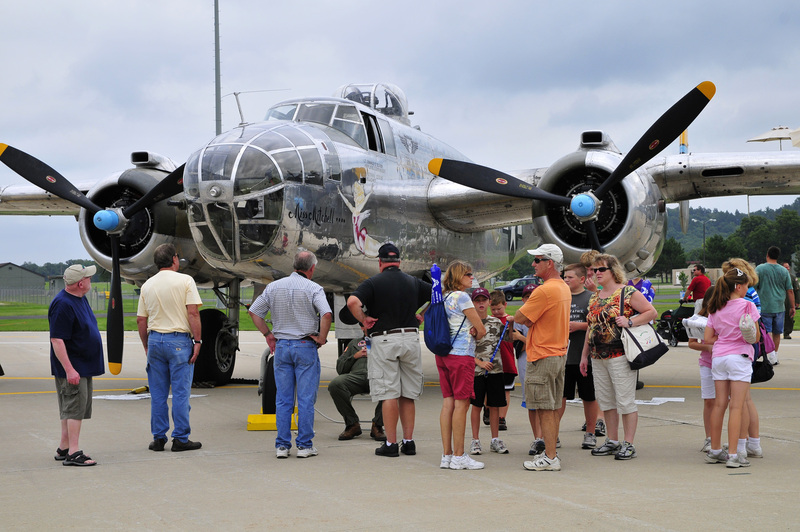 The B-25D was the Kansas City plant version of the B-25C, and did not differ significantly in design. 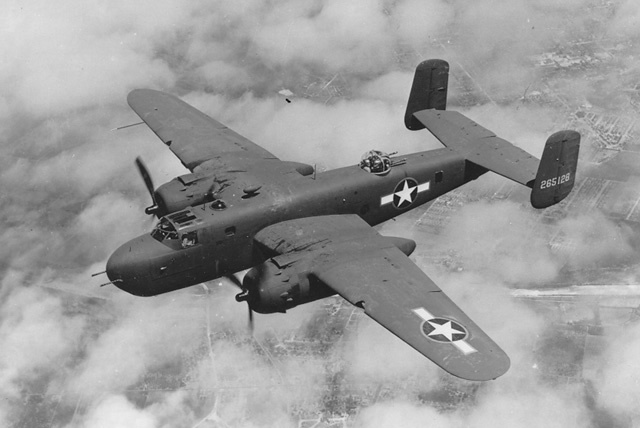 The B-25G had a solid nose fitted with a 75mm M4 gun with 21 rounds and two fixed 0.50 machine guns. It could carry 8 5" (127mm) rockets under its wings. It was generally field modified in the Southwest Pacific with the addition of two more fixed nose machine guns and four fixed machine guns in forward-firing blister packs. 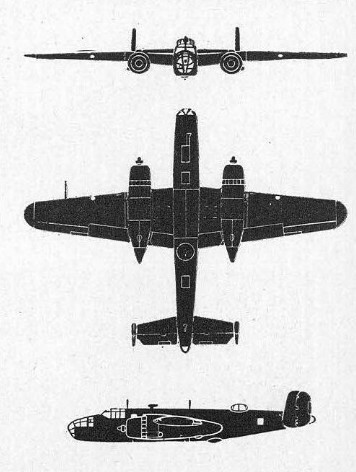 The B-25H had an improved 75mm gun and had four fixed nose 0.50s and two 0.50s in the right blister. It also added two machine guns in waist bulges. It upgraded the engines to two 1850 hp (1379 kW) R-2600-29s. It was controversial for its omission of the ventral turret and the copilot position, but it added a tail turret with two 0.50 machine guns. The B-25J also came in a solid-nosed version with five fixed 0.50 machine guns for a total of 13 machine guns with a total of 5000 rounds. The F-10 was an unarmed photoreconnaissance version. It was too vulnerable for use in combat reconnaissance, and was used for photographic charting of poorly charted areas of Alaska, northwest Canada, and (once air supremacy was achieved) the "Hump". It could photograph 20,000 square miles (52,000 km2) in four hours. The PBJ was a Navy patrol version equipped with an ASG radar. The PBJ-1J, introduced just before the surrender, was stripped of all but one tail gun in order to carry two 11.75" (298mm) "Tiny Tim" air to surface rockets. The B-25B was the plane flown by the Doolittle raiders. It was extensively field-modified in the Southwest Pacific with forward-firing machine guns to make it an effective low-level strafer. 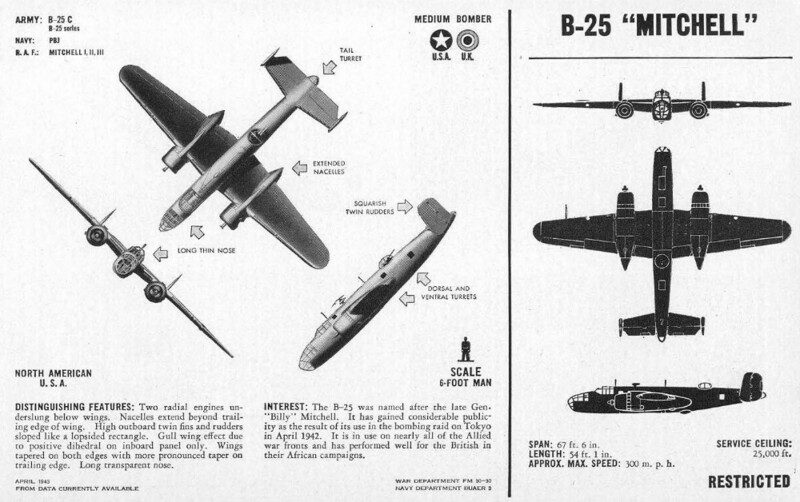 These field modifications were adopted by the factory as the B-25G and later models. Thus modified, the B-25 was a potent ship killer, able to put an amazing amount of metal on the target to suppress antiaircraft fire and then skip-bomb to sink the target. Against land targets, such as airfields, it made very good use of parafrag bombs. The aircraft was developed in response to the Army Air Corps' March 1939 call for proposals for a fast medium bomber. The winner of the design contest would be awarded a contract for 385 aircraft. North American's chief designer, Lee Atwood, based his design on the earlier NA-40B, which had been developed as a private venture by North American (which had never before designed a high-performance multi-engine aircraft.) The NA-40B had been dogged by bad luck (including the crash of the prototype in April 1939) but was regarded as a very promising basis for the new design, which was rushed through in just 40 days. The only serious competition came from Martin, whose design became the B-26 Marauder. 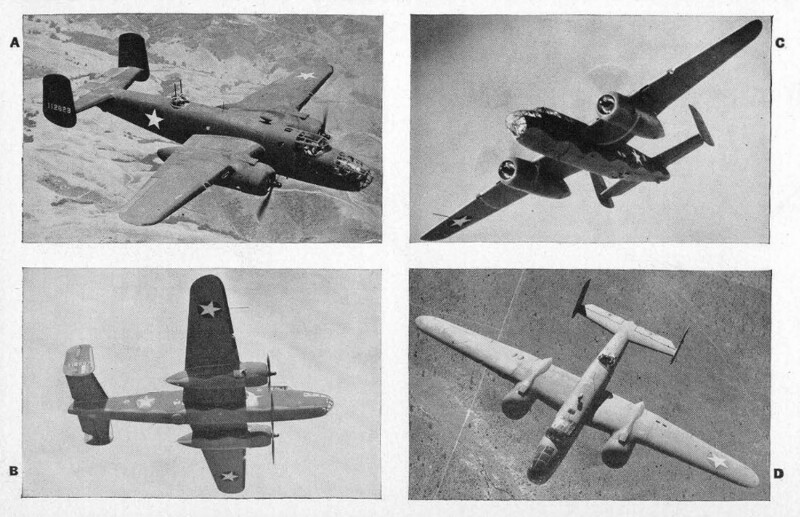 However, Martin had limited production capacity, the B-25 was simpler to construct, and the Army Air Corps chose to split the contract, awarding Martin a contract for 201 B-26s and North American a contract for the remaining 184 aircraft. The prototype first flew in August 1940, proved pleasant to handle, and went into production at once. However, early models suffered from a "Dutch roll" that required redesign of the tail surfaces and wing dihedral. 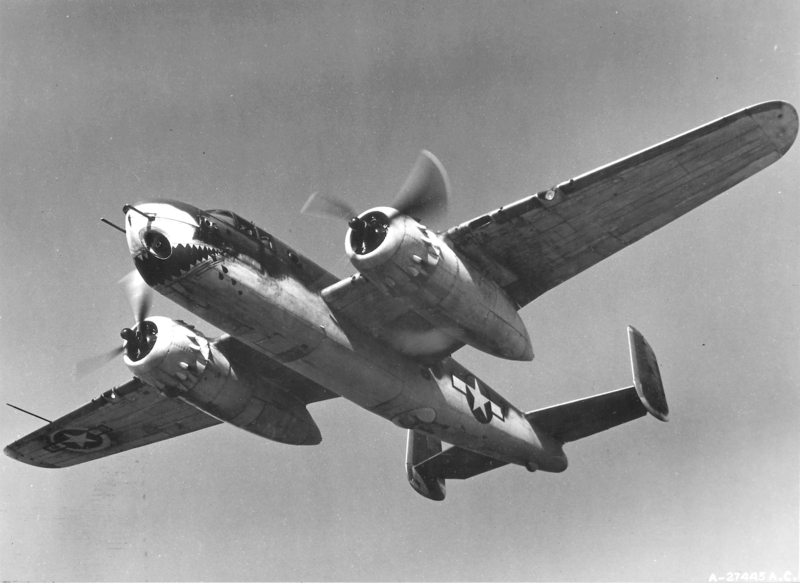 The B-25C was the first true mass-produced version, appearing in early 1942. In addition to its excellent flight characteristics, the Mitchell had excellent cockpit visibility, especially downwards and to the sides, which proved important in its later role as a surface attack aircraft. It suffered significantly lower combat losses than the rival B-26. The 75mm gun on the G and H (and field-modified early models) was was a potent weapon, but it was heavy and had a slow rate of fire and a frightful recoil. Its use also required a steady attack dive that left the aircraft vulnerable to enemy defenses. It was understandably not popular with its crews. The gun was omitted in both versions of the definitive J model, perhaps because the introduction of 5" rocket armament made it superfluous. There were three squadrons of B-25s at Pendleton Field when war broke out. 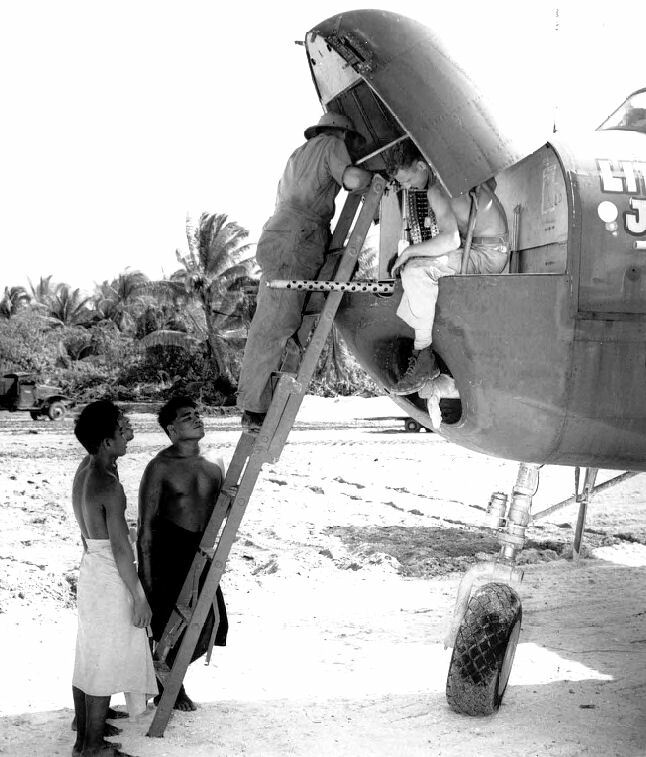 Subsequently, over 60% of B-25s were allocated to the Pacific. Cost of production was $180,031 in 1939-1941 and dropped to $116,752 in 1945.